Warm weather, endless evening skies, and amazing memories fill summertime. As you are thinking about what summer memories to make this year, make sure to check out Lake Pointe Inn. There are so many things to do and experience in the area, you are sure to have a blast this summer! The Laurel Highlands River Tours are fantastic! The exciting tours will take you on a trip of a lifetime. Here’s all you need to know about the Laurel Highlands River Tours! Located in the heart of beautiful Ohiopyle State Park, PA, the Laurel Highlands River Tours and Outdoor Center offers visitors a chance to experience all the extraordinary scenery of the park, whether by land or water. The Laurel Highlands River Tours are all fully guided trips and take passengers aboard down the middle, lower or upper Youghiogheny River or Cheat River! 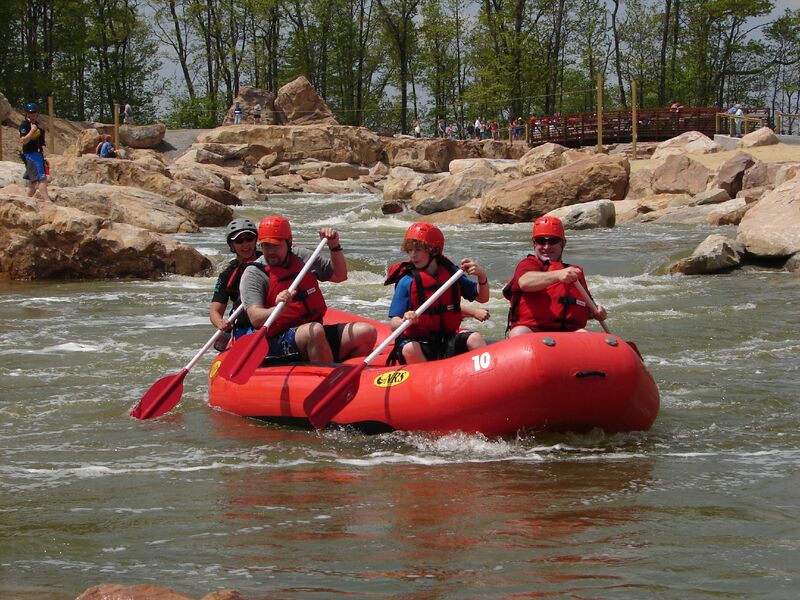 One of the best things that the company offers is the whitewater rafting tours! In 1962, Laurel Highlands started offering guided whitewater rafting tours and now more than 50 years later and over a million river miles paddled, the company still gives visitors an experience unlike any other! For those looking for a calm and relaxing experience, take a Middle Yough tour. Passengers aboard will explore the picturesque Youghiogheny River valley! Take the Lower Yough tour and enjoy the spontaneity and sheer fun of a run down the stream! If you are an adventure enthusiast, enjoy the largest uncontrolled watershed in the East, which also feeds the mighty Cheat Canyon! This section of the Cheat River is arguably the most challenging river run on the East Coast. To top off all the tours listed is the Upper Yough tour! If you are looking for the extreme experience, take this thrilling tour. This tight river offers several drops, with sections falling more than 115 feet per mile! If you wish to experience this tour, it takes a special raft and guide. This difficult river is only for experienced rafters. Step up to the challenge and have an unforgettable experience! To book your tour today, click here! If there is someone in your group who doesn’t like the idea of whitewater rafting, Laurel Highlands River Tours and Outdoor activities offers so much more than just rafting! From zip lining to rock climbing, you are sure to find something that suits your skill level. The guided kayaking tours are a great way to explore the area on the water without all the adrenaline. As you decide which of the Laurel Highlands River Tours take, don’t forget to find a place to rest and relax after. Lake Pointe Inn is the perfect place to which to return to rejuvenate. Recount your whitewater rafting adventures shot for shot around our fire pit or on the wrap-around deck with spectacular views of the lake. Our rooms and suites with cozy amenities and comfy furnishings are the ideal place in which you can relax after a memorable day on one of the Laurel Highlands River Tours. Before you leave for the day, we will serve you a hearty breakfast. Staying at Lake Pointe Inn will make your visit to the lake unforgettable!